For some, the home provides respite from frigid winters, scorching summer heat and long days at the office, but with summer on the horizon and work cultures allowing more people to work from home, there is a greater need for understanding how to shift negative or stagnant energy from your home to create a high vibrational space. There are infinite ways to raise the vibration of your home, however, the following fifteen are best-practices from an energy healer’s perspective. Smudging is like an energetic cleanse for your home, workspace or body. The smoke from smudge sticks, like dried sage or palo santo for example, can change the ionic composition of the air, which may directly reduce your response to stress, according to mindbodygreen’s Tiffany Maloney. The use of smudge sticks can be traced back nearly 2,000 years to Indigenous Americans and shamans who used the smoke from smudge sticks to release or cleanse negative energy from conflicted, angry or sick people. Try smudging your space just after you clean it, before or after guests visit, or to shift the energy in your space as needed. Fresh air can do wonders for your health and happiness because it’s filled with negative ions, which are linked to an improved sense of well-being. According to the Environmental Protection Agency, the indoor air in the United States is two to five times more polluted than outdoor air. Breathing in fresh air can boost your immune system, increase your energy, increase your heart and brain health, and create a calming effect on your nervous system, among other things. Release stagnant energy from your home and your body by spending a little more time outdoors and opting for open windows over flipping on the air conditioning when possible this season. Clutter=stagnant energy. Decluttering the areas of your home, particularly the areas you interact with regularly, can do wonders for your mood and help you feel less stressed and more content inside of your space. A lot of stagnation can happen in your closet, pantry, and junk drawers! Try spring cleaning your closet by moving sweaters or winter-specific items to storage bins and donating items you haven’t worn in the last six months. Open your fridge and pantry to check expiration dates, and donate food you don’t intend to eat. Invest in organizational tools to zen-ify junk drawers and cabinets. Decluttering can create a calming effect on your mind, creating literal and mental space for more things you enjoy. 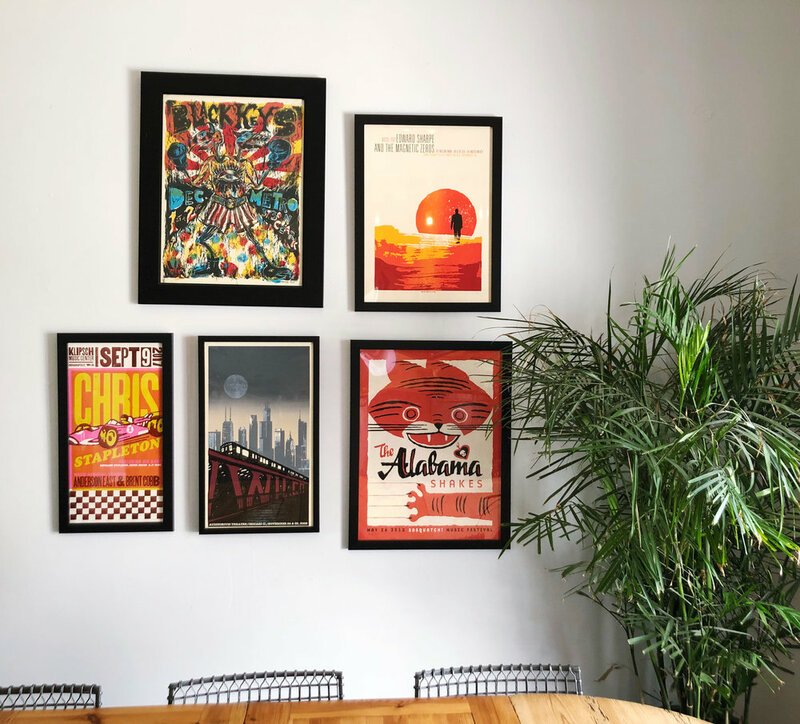 It’s easy to get tired staring at the same things day in and day out, which is why rearranging the art in your home can invigorate your space and lead to inner and outer harmony. “Re-purposing what’s [in your home] is a feel-good option. Improvement occurs without buyer’s remorse and additional objects to manage. One feels clever, creative and resourceful [after rearranging the art in a home],” according to Carrie Barron, M.D. from Psychology Today. Does your art always seem to look a little off? Apparently, it’s common for art to be hung a little too high or low. Shutterfly recommends hanging the center of the art piece at 57 inches from the ground, which reflects the standard eye-height of the average person and is used as a standard in most art galleries and museums. Take a walk through your space and consider moving a few art pieces around or adjusting the height of existing art. Invite some of your besties over and have a party! Laughter really is the best medicine, and it also has the power to raise the vibes of your space. The only rules are: leave the drama at the door. Gossip and negativity aren’t high-vibe, so stick to love, comedy and reminiscing about old memories. The more often you invite people over, the more magnetic your space may become. My favorite form of aromatherapy is using a diffuser with essential oils and candles. Your mind is a compilation of your five senses. When you inhale an aroma, the scent immediately awakens your hypothalamus, an organ in your brain responsible for a multitude of bodily functions, including sleep, growth, emotional response and more. By filling your home with pleasant scents, you’re triggering a positive emotional response in your brain, creating a balancing effect on your current state of mind. Try using these essential oils for relaxation and stress release: Lavender, rose, ylang ylang, vetiver, frankincense, chamomile, or bergamot. Crystals have healing properties and placing them throughout your home can have an impactful effect. According to Energy Muse, there are two must-have crystals for a negativity-free home: black tourmaline and selenite. Black tourmaline is an extremely high-vibrational grounding and protective crystal, providing protection against any negative or harmful energy, including EMFs and geopathic stress, in addition to clearing, cleansing and unlocking all energy blockages within your home. Selenite crystals pack a powerfully protective yet angelic peacefulness to calm your home. Known for quickly unblocking any stagnant or stale energy, these crystals also upgrade the vibration of anything placed upon it! Scatter crystals throughout your home to raise the vibration of your space and cleanse unwanted energy. Meditation calms your mind and body, which can have a similar effect on your home. When you meditate inside your home, you’re changing your vibration which, in turn, changes the vibration of the space you’re meditating in. Since your body is roughly 60 percent water, YOU can be significantly affected by the conversations you engage in, the podcasts you listen to, how much time you spend absorbing the news and, of course, the type of music you play inside your home. Start being mindful of the vibrational frequency of the sounds in your home and in your life. Notice how certain songs make you feel or how your body reacts to shows with high drama. Lighten the mood by playing songs you like to sing along to, elevating your mood and raising the vibration in your home. If you need to raise the vibration of a space, say, after a stressful call or an argument with your partner, an easy and free way to do that is by snapping and singing out loud in your space. Growing up, my mom had this annoying habit of snapping like a crazy person whenever a conversation turned too negative or mean. Although I don’t snap in the middle of a negative conversation, I do, sometimes, snap while at my desk when feeling stuck or when I notice my thoughts becoming exceedingly negative. The next time you’re stressed or stuck, try snapping. Science shows that plants increase the circulation of healthy air inside our home while certain flowers, like lavender and rose, promote relaxation. The visual sight of greenery in a home has a positive effect on your psyche, helping you feel more relaxed and calm. Even NASA concluded that house plants can reduce air toxins by 87% in 24 hours. Add plants to the spaces you hang out in the most to increase relaxation and reduce stress. Rearrange your entryway to become an intentional space by placing sentimental imagery or objects, like photos, plants, crystals or candles, to create a warm and inviting welcome for you and your guests. Clear away all shoes and clutter to rid the space of stagnant energy, and avoid placing a mirror directly opposite of your door to avoid your chi, or energy, from bouncing right back out the door. Recently, a client asked me how to raise the vibration in her shop after a highly stressful interaction with a vendor. I invited her to go into the middle of the shop and sing at the top of her lungs, in an operatic voice. Singing can help us connect more deeply with ourselves because it can feel vulnerable to use our voice in an intentional way, especially when we’re asked to raise our voice. Singing loud and proud in the middle of your space shifts the vibrational resonance to one that matches your personal frequency. Not to mention, singing at the top of your lungs may not be a regular occurrence, which can create a sense of freedom and lift your spirit. If this feels totally out of your comfort zone, not a problem! Singing, in general, is a beautiful option to upgrade the energy in your space. It’s well-known that laughter is the best medicine, and I don’t disagree. Laughter can be contagious and it’s one of the best remedies for elevating the energetic frequency in a space and within yourself. Turn on a comedy, call a good friend or simply invite yourself to smile for no reason. Happiness is a state we sometimes have to work for, and the effect on our psyche and our space can make all the difference. Dusty cabinets, grimy floors, and scummy sinks do not feel warm or welcoming. One of the easiest ways to raise the vibration of your space is to clean it. The next time you’re feeling stressed or discontent in your space, open a window, turn on a diffuser and laugh. It’s only a matter of moments before the vibe in your space begins to shift.